At long last I have a digital copy of "Al Tudi Tuhak," my student film from Cal/Arts! For years I've only had the 35mm prints, and some old video tapes. This last January I was invited to show "Al Tudi Tuhak" at the Bay International Children's Film Festival. A huge thanks to Jim Capobianco, who offered to make the digital transfer from 3/4" tape for me. Jim is a really great guy, and talented director, animator, and artist. Check out his website . He and his group are doing some really interesting things. 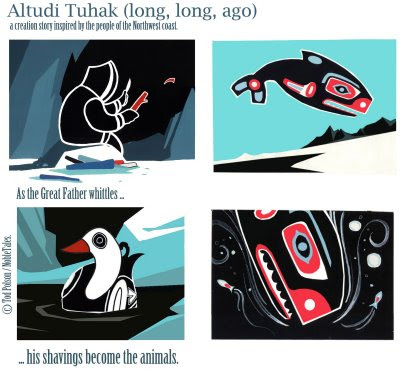 "Al Tudi Tuhak", is an original story inspired by the art and culture of the natives of the northwest coast. The film was made under the guidance of my mentors Jules Engel (UPA, Cal-Arts), and Maurice Noble (Disney, Warner Bros). With narration by Maurice, and music by Bill Benson. Jules and Maurice were both wonderful, passionate, designers; with two very different approaches to design. This film marks an amazing, yet confusing time for me. It was a huge step in helping me develop my own design philosophy. The art is a mix of latex house paint on cels, and cut-outs. I shot "Al Tudi Tuhak" on 35mm at Stokes/Kohne in Los Angeles. Dan Kohne was nice enough to let me use his Oxberry camera on the nights they weren't using the studio. And he and Billy Robinson were extremely patient with all my late night camera questions. I learned that it's hard shooting on black! Dust, fingerprints, everything show up under camera! The water effects were shot using double exposure with a ripple glass. Maurice sat in quite a few nights as "camera assistant." He taught me how important it is for a designer to know the capabilities of the camera. Ben Jones, and Mike Polvani were kind enough to help me out with a few scenes of animation. Bernadette Gonzales helped supervise the ink and paint. ... and a big thanks to my friends in the Philippines who helped out along the way.